The Peace Accords Matrix (PAM), an interactive database featuring data on comprehensive peace agreements signed since 1989, increasingly is being used as a tool in peace negotiations. Developed by faculty of the University of Notre Dame’s Kroc Institute for International Peace Studies, PAM is accessible to scholars and journalists conducting research on peace processes and peace accords. In recent months, Kroc Institute faculty involved as advisers in high-level peace processes in several conflict zones also have used PAM in meetings with secular and religious actors and government officials. It also provides the implementation status for each component. The interactive matrix makes comparisons rapidly and accurately, Joshi said, which can help overcome obstacles that otherwise might cause negotiations to stall. Since most peace processes fall apart in the first few years, speed in accessing reliable data during complex negotiations is essential to keep the process moving forward. While hundreds of peace agreements are developed each year, fewer than 40 worldwide are “comprehensive” — defined as a written document produced through negotiated process in which the major parties in the conflict are involved and all the substantive issues underlying the dispute are included in the negotiation process. Twenty-eight comprehensive peace accords (CPAs) are currently available to the public on the Peace Accords Matrix. All of these have been researched at the Kroc Institute and ratified by at least two local experts. Another 10 CPAs are in the process of being researched. Initially developed with a grant from the United States Institute of Peace under the direction of John Darby, professor of comparative ethnic studies at the Kroc Institute, PAM is designed for use by scholars, policymakers, peacebuilders and journalists. 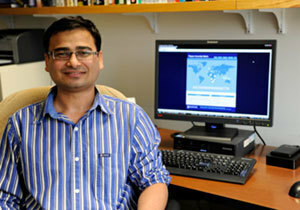 Joshi populates and manages the database — this year with research assistance from Matthew Chandler, Ph.D. student in sociology and peace studies — while contributing to collaborative research on peace accords and processes. Notre Dame’s Kroc Institute is a leading center for the study of the causes of violent conflict and strategies of peace. The institute offers undergraduate, master’s and Ph.D. programs in peace studies to students from around the world. Originally published by Joan Fallon at newsinfo.nd.edu on March 02, 2012.